Incredibly, all of these figures are made of‑sand! Don’t be surprised. This exhibition, called Holy Russia, presents monumental sand sculpture. It is very easy to find, being located right next to the Cathedral of Jesus Christ Our Savior in Vsekhsvyatsky Proyezd. The exhibition was organized by the Association of Professional Artists. 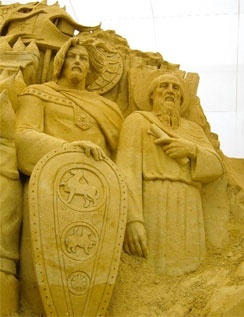 As the director of the association, Dmitry Kalinichenko, told me, the first sand sculptures were created on the shores of Australia by Russian sculptors at the beginning of the 20th century. 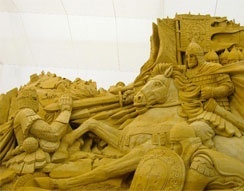 Today competitions and exhibitions of sand sculptures are very popular and are held throughout the world. This particular exhibition was created by 11 top masters from six countries. It only took them two weeks to create monumental figures of legendary heroes of old Russia: Prince Vladimir; icon painter Andrey Rublev; warlords Dmitry Donskoy and Alexander Nevsky; popular Russian saints Serafim of Sarov and Sergius of Radonezh. The exhibition was blessed by the Patriarch of Moscow and All Russia Kiril. The exhibition is supported by the World Federation of Sand Sculpture and the World Academy of Sand Sculpture. 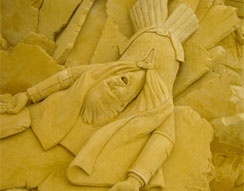 The exhibition is participating in the World Sand Sculpting Championship. The central piece of the multi-figure composition which enjoys a prominent place in the exhibition, is a sand version of the Church of the Virgin’s Intercession on the Nerl built in the 12th century. Its facade has the famous icon of the Holy Trinity painted by Andrey Rublev, in 1411 or 1425-27, with the icon-painter himself sitting in front of the Church facing the viewer. 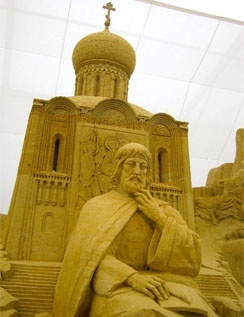 The sand-sculpture of the church was created by sculptor Vadim Gryadov from Ekaterinburg, and the figure of the icon-painter was created by master Vladimir Kuraev from Moscow. Vladimir Kuraev is one of the top five best sand and ice sculptors in the world, and the leader of the whole project, while Roman Podgorny, the project’s art designer, did all the sketches for the figures and the church. All in all, there are 100 known sand sculptors in the world, 20 of whom are considered to be professionals. “The figures done by the Russian sculptors look Russian,” says Dmitry Kalinichenko. “The faces of those done by our foreign colleagues are different.” Indeed, Alexander Nevsky, created by Ray Villafane, the US master, does not look exactly Russian, but heroic anyway. “Our priority was not to have a Hollywood star instead of our Russian legendary commander,” laughs Dmitry. Fortunately, all the figures look great and but for this remark I would have never noticed the difference. In this scene, Alexander Nevsky is fighting and defeating Teutonic and Livonian Knights in the famous battle on the ice (1242). The knights were created by Roman Podgorny and by Pedro Mira, a Portuguese sculptor. When you enter the 450 square meter pavilion, the first thing you see is a fallen knight in armor going down the hill, his head first, his body following. The sand used in this exhibition contains 7-8% of clay. The large sculptures, such as the Church on the Nerl, which took 1.5 tons of sand, and would be impossible to construct if no clay at all was used. Every day a special technician sprinkles the sand figures with water and clay using a special pump. The exhibition “Holy Russia” is open daily until the end of September from 10 a.m. to 9 p.m. (no lunch breaks). Entrance fee – 200 roubles. Photographing is free.